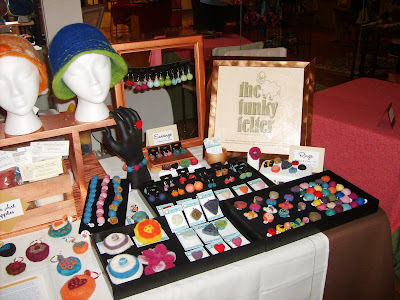 The Funky Felter: The KC Etsy Trunk Show . . . The KC Etsy Trunk Show . 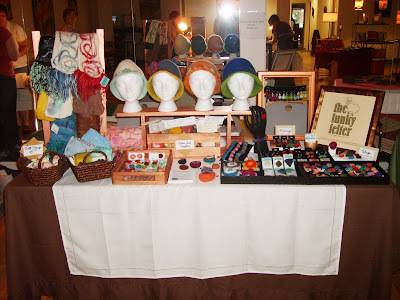 . .
Well, last night was the Kansas City Etsy Trunk Show! 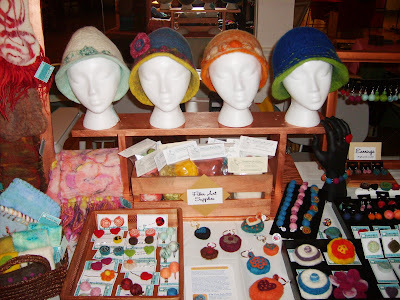 It was only my second public venue for selling my felted goodies. The atmosphere was really nice, and it was a great opportunity to meet several local Etsy sellers. Thanks to Janay of abstractpretty on Etsy for organizing the local event. Overall, I count the event as a success because of the great local exposure, chance to learn, and opportunity to meet other Kansas City artists and crafters. Honestly, I didn't sell very much, but it is a hard sell for woolly items in 100 degree weather here so I'm not too disappointed. I hope to participate in more and more local and national events like this one in the future! Here's some photos of my booth display which, admittedly, needs a little tweaking to look better. My husband built the wonderful hat display and scarf rack, but I'm still working on the layout and color scheme. There's also more photos of my table display and the event on my flickr account if you'd like to see.